The Office of General Services is a New York state agency tasked with handling the media needs of the entire state government, including streaming public meetings live online and broadcasting live events at which the governor is speaking. Comrex LiveShot is our primary method of video encoding and live acquisition in the field. We have three rack-mounts and four portable units, all of which we use frequently. We purchased our LiveShot units in 2014, when we were covering Gov. 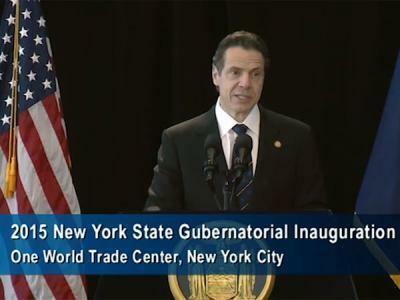 Andrew Cuomo’s inauguration. For that event, we needed to figure out how to broadcast live video from the 65th floor of the unfinished World Trade Center. We managed to get access to a wired internet connection, which worked very well for us and remains our preferred method of connection. Since then, one of the main ways we use LiveShot is for public meeting coverage. We typically arrive at a meeting location with a small crew of two people and set up a combination of robotic cameras with a small switcher. We then coordinate a three-camera program from the meeting room and use the Comrex to transmit video back to our studio. From there, we send footage to the CBN for distribution. Depending on our client, we have as little as a few hours to plan our shoots. LiveShot allows us the flexibility to arrive and set up without difficulty. Overall, we’re very happy with the devices—we bought seven of them! We’ll continue to use them as our preferred encoding and decoding equipment. Shawn Fitzgerald is a media information engineer for the Office of General Services in New York. Want more information about LiveShot? You can write to us at info@comrex.com, or call us at (978) 784-1776.